What does it mean to be a 'Natural Voice practitioner' and how does that differ from traditional singing teachers? As network practioners, we hold that singing is our birthright. This seems to me to be the core of our practice, and certain approaches and attitudes follow from this. As Stuart Jones (member of our EC) said recently, "A cultural injustice has been perpatrated on the people of these islands". In the 17th century, the English were known on the continent of Europe as the 'singing English'. And there is plenty of evidence that singing remained an inclusive activity well into the 19th century. But it was undoubtedly during the 1800s that the shift to singing as an exclusive activity, rather than an inclusive one, began, especially in England. I have written more about this in other places. Suffice it to say that the rapid rise of an aspiring middle class, who wished to behave and sound differently from the 'rough' working class population, resulted in the clergy and the educators imposing a genteel aestetic. So was born the notion that there were people would couldn't sing. I contend that the attitude was as much that they shouldn't sing, because their voices were considered crude and vulgar - i.e. they sang in the way that they had sung their folk and popular songs for generations. Somehow this idea became so embedded that, by my generation, the first thing a music teacher did was to weed out those who couldn't immediately pitch accurately to a piano, recorder or adult voice, or produce the kind of sound deemed desirable. What a strange notion! Something that we know now to be innate was turned into an activity that wasn't even considered teachable. Would a maths teacher arrive for their first lesson with the idea of excluding all of the children who couldn't already add two and two? I think that offering this historic perspective can release people from the emotional damage and loss of confidence that often accompanies those who were told they couldn't sing / had unacceptable voices. Over the 35 years I've been running workshops, one of the saddest things I've heard is for someone to say "I feel ashamed of my voice". And it is clear that this damage can be done in one judgmental statement, especially when the recipient is still a child. We are in a position to show that this is 'cultural baggage' and that they are not personally culpable. As network members, acknowledging these historical, social and psychological factors is one of our valuable tools in helping to release the inhibitions, embarrassments and lack of confidence that so many suffer from in our culture. For such people, this seems to be a prerequisite for generating the relationship of energy and relaxation required to release full vocal potential and develop expressive, interpretive musical skills. Another key aspect to our approach is the need for anchoring the voice in the body and the related understanding of the role of the breath. Historically, our name and approach was a result of interweaving two sources of inspiration. 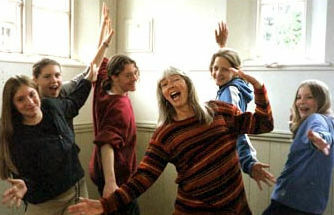 The natural voice teaching from theatre exponents as Cicely Berry, Kristin Linklater and Joan Mills was musically expanded by incorporating knowledge gleaned from a range of ethnic voice styles and the possibilities that these open up for a wealth of vocal expression. Both of these strands point to how, for the most part, we lead much more sedentary lives that our ancesters. However, we evolved the ability to sing when we needed to use our bodies a great deal more than we do now. The voice will not fully connect to the emotions if it isn't fully connected to the deep breath. Laying hands on modern urban ribs is salutary; few of us naturally breathe fully and deeply nowadays. Hence the NVPN commitment to the physicality of the voice is remedial, given the loss of physicality in most of our current lifestyles. Frankie Armstrong is considered by many as the inspiration behind the whole Natural Voice movement in Britain over the last forty or so years. This article sets a very clear historic and social context for what Natural Voice Practitioners stand for.